We could never have pulled off this event if it weren’t for some great people and companies. For the wonderful venue that were perfect for Hack4Europe, for all the help with everything. Making sure we had everything we needed, letting us use your stuff and for being so great and friendly! Not only did they send Kristina Alexanderson to be a part of our jury and to do a great speech at the seminars, they also were responsible for the network and Internet-connections. They did an awesome job and helped us with both small and big things. Björn Falkevik and Petter Karlsson. Awesome guys. They broadcast the whole event live, edited the clips, uploaded to Youtube, did interviews and took care of everything technical with the seminars and presentations. They also helped out wherever they could. For great prizes to all the winners. For their contribution to the after prize ceremony party. The food was provided by Maison Pierre. A big thank you to Kristina Alexandersson, Joakim Jardenberg, Jonas Söderström, David Haskiya and Johanna Berg for great seminars. Kristina and Joakim were also part of the jury. We are very grateful! We also need to thank everyone from Riksantikvarieämbetet and David Haskiya from Europeana that helped us before, during and after the event. Without them this wouldn’t have turned out like this! All the developers that sat in a dark room for almost 24 hours, all the guests at the fridays seminars and everyone that followed the event on Twitter and Bambuser. What tools helped us with Hack4Europe.se? This website was created just a few weeks before the actual event and during the event it was run by one person. That wouldn’t be possible without the help of some wonderful tools (and people). Here’s a list of the tools and how we used them. The website is built on open source CMS WordPress and hosted at Binero. The theme we used is called Notes Blog and is developed by Thord Daniel Hedengran. It is slightly modified to fit our needs. It’s a great theme and I recommend trying it out, especially if you want to make simple designs with child themes. It’s free to use and posted under GPL. The plugins used are held at a minimum, but we used All In One SEO to make sure the title-tags and meta-descriptions and other stuff were SEO-friendly. We also used a plugin for Google Analytics called Ultimate GA. Twitter Goodies and Blackbird Pie were used for some Twitter integration. Disqus were used for comments. Both Disqus and WordPress comments are easily moderated via iPhone apps. The website was set up in less than one day. We took a lot of photos during the events, and 113 of them (so far) made the cut and got uploaded to our Flickr-account. We have a Pro-account which makes all photos downloadable in high resolution. All photos uploaded by us are licensed with Creative Commons. CC-BY to be more precise. Most of the photos were uploaded during the event. All seminars and presentations and the award ceremony were broadcast live with Bambuser. Minutes after it were broadcasted, it were uploaded to our Youtube-channel and embedded on the site. Simple as that. We tweeted a lot, so did the developers, guests and people watching the events live. Everything were monitored with Tweetdeck. We used both the @raa_se account as well as our own. I will soon put up a similar post with all our partners and sponsors. Without them the whole event wouldn’t have been possible. At 15.30-15.50 you can watch the award ceremony live from Digital Agenda Assembly in Brussels. 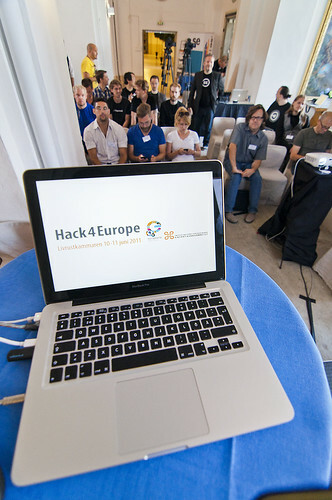 Swedish newspaper Dagens Nyheter writes about Time Mash and other Hack4Europe Sweden entries at Teknikbloggen. Also a short interview with Jonas Bolin from Team Duvebol. At 12am today, Europeana announced the four finalists via their Twitter-account. We are happy to say that Team Duvebol and their application Time Mash is one of the finalists and will be going to Brussels on June 16-17, representing Sweden at Digital Agenda Assembly. Update: Fredrik Sand, Stockholm Chamber of Commerce, has written a piece as well. David Haskiya, from Europeana, has created a Scoop.it-feed about the events last week. Åke Nygren from Information Today Europe writes a long article. Kristina has also uploaded some wonderful photos from the event. inUse Consulting, which had a team in the competition, has also uploaded some great photos. Henrik Summanen, Swedish National Heritage Board, elaborates on the subject Not Online = Total Waste, as mentioned by Joakim Jardenberg. Kristina Alexanderson från .SE – Webbstjärnan har laddat upp sin presentation på Slideshare. Kristina har dessutom skrivit ner några tankar från dagen. All photos from the event can be found, and downloaded, at our Flickr-account. All photos are CC-BY, so they are free to use but remember to attribute the source.